This month brought me to a milestone: my 40th high school reunion. This month brought me to a milestone: my 40th high school reunion. The celebration included a tour of our high school, which inspired a great deal of recollection and reminiscence. I was struck by how many times my classmates and I talked about our out-of-classroom experiences. We threw some balls around the gym, found our signatures on an old exposed beam under the stage in the drama wing, and remembered how we had rearranged Room 202 to practice mock debates for Forensics Club. Over the last nine months, Ellen Gannett, former director of the National Institute on Out-of-School Time, has transitioned to a new part-time role as NIOST’s senior strategist. Georgia Hall, the new director and managing editor of Afterschool Matters, asked Ellen to share her perspectives on the field and on a lifetime dedicated to raising the quality of youth experience during the out-of-school time hours. Out-of-school time (OST) programs serve youth from diverse demographic backgrounds. According to the Afterschool Alliance, of the 10.2 million young people in OST programs in the U.S., 24 percent are African American and 29 percent are Latinx; 45 percent qualify for free or reduced-price school meals (Afterschool Alliance, 2014). Research has shown that youth from low-income and minority backgrounds consume less healthy diets than youth from high-income families (Kant & Graubard, 2006). OST programs, whose informal settings provide opportunities for experiential learning, can address this problem by implementing nutrition and food-preparation programming to improve participants’ dietary knowledge and behaviors. 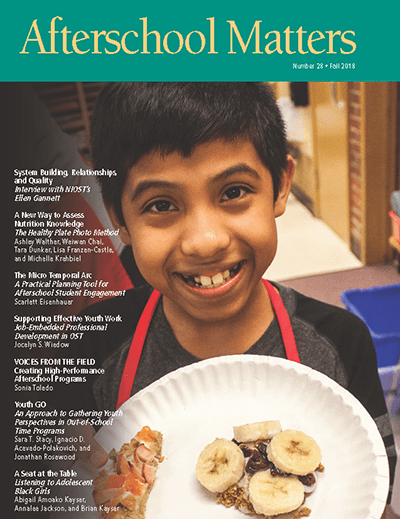 Our contribution to this effort is WeCook: Fun with Food and Fitness, an OST curriculum for fourthand fifth-grade students focusing on food preparation, nutrition, and physical activity. In the process of piloting this program, we discovered the need for a nutrition assessment that would be time-efficient, developmentally appropriate, and user-friendly. Our solution was to develop a novel tool called the Healthy Plate Photo (HPP) method, based on the U.S. Department of Agriculture (USDA) MyPlate guidelines (USDA, 2017). Youth work practitioners play a critical role in providing high-quality out-of-school time (OST) opportunities. Research shows that high-quality programs contribute to positive outcomes for youth (National Institute on Outof- School Time, 2009). Beyond research, practitioners tell stories that reflect how youth worker quality affects youth experience, both positively and negatively. In more than 25 years of training afterschool directors in New York City, I have learned that one of the greatest challenges supervisors face is developing and retaining their staff. I spend most of my energy researching best practices for afterschool and figuring out how to educate directors and make the research applicable to their work. One of the most consistent complaints I have heard is high staff turnover. Site supervisors are in a continuous struggle to develop and train new employees on the fundamental skills—managing groups, dealing with disruptive behavior, and so on—that youth workers need before they can successfully implement learning activities. Including youth in the development and evaluation of outof- school time (OST) programs has positive effects on youth, the organizations that serve them, and the communities in which they live (Checkoway et al., 2003). Such involvement can improve young people’s social competence (Hubbard, 2015), foster leadership and engagement (Zeller-Berkman, Muñoz-Proto, & Torre, 2013), and empower groups (Berg, Coman, & Schensul, 2009). Despite having many identified strengths, adolescent Black girls in the U.S. have historically fared poorly (Crenshaw, Ocen, & Nanda, 2015). Research indicates that, compared to their Latina and White counterparts, adolescent Black girls carry a higher risk for suffering poor physical and mental health, enduring violence, and dealing with other factors associated with living in poverty (Eccles & Gootman,2002).